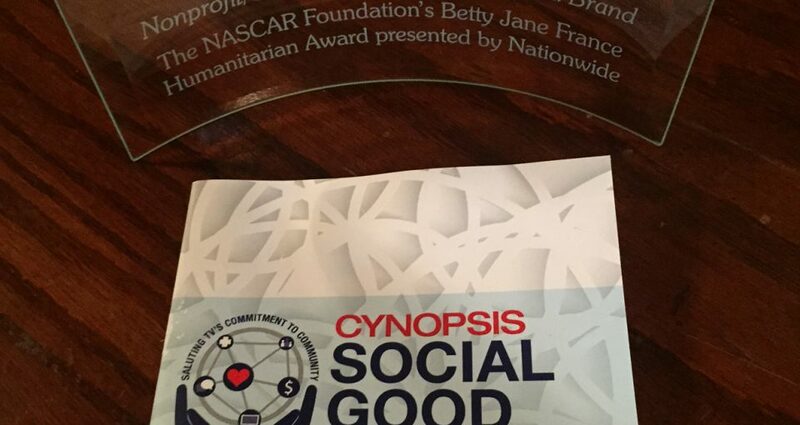 DAYTONA BEACH, FLA. – The NASCAR Foundation and Nationwide were honored at the Cynopsis Social Good Awards in New York City, winning the award for Nonprofit/Corporate Partnership with a Brand for The NASCAR Foundation’s Betty Jane France Humanitarian Award presented by Nationwide. Cynopsis Media hosted the second annual Social Good Awards Breakfast April 7 at the New York Athletic Club in New York City to celebrate achievements by brands, networks and digital entities over the past year. The NASCAR Foundation’s Betty Jane France Humanitarian Award presented by Nationwide honors a NASCAR fan who embodies the ideals of charity and community that France, the Foundation’s founder and chairwoman emeritus, has championed throughout her life. This year marks the sixth annual presentation of the award and NASCAR Official Partner Nationwide’s second year as presenting sponsor for the award. Since the award’s inception in 2011, The NASCAR Foundation has donated more than $875,000 to children’s charities across the country in honor of outstanding volunteers. And, through all finalists’ combined efforts, the lives of nearly 200,000 children have been positively impacted. “We are so pleased to receive this recognition for our Award and the partnership with Nationwide. Impacting the lives of children by honoring volunteers who are the heart and soul of charitable work is one of our most meaningful programs,” said Lorene King, executive director, The NASCAR Foundation. With a panel of judges who benchmark excellence in the area of social good in the TV and entertainment industry, Cynopsis Media’s Cynopsis Social Good Awards honors everything from sustainability partnership and PSA’s, to diversity campaigns, environmental initiatives and more. The National Association for Stock Car Auto Racing Inc. (NASCAR) established The NASCAR Foundation in January 2006 to support initiatives that positively affect the lives of children throughout the United States. The 501(c) (3) non-profit entity partners with medical experts and other charitable organizations to fund children’s health care programs. Now celebrating 10 Years of Giving in 2016, The NASCAR Foundation has cumulatively donated $25 million to reach more than one million children. For more information on The NASCAR Foundation, please visit: NASCARfoundation.org. Follow The NASCAR Foundation on Facebook: www.Facebook.com/NASCARFoundation or on Twitter: @NASCAR_FDN.